I got an overdraft notice from the bank this morning, accompanying a $35 fee and bounced rent check. I washed all my black clothes—in bleach. I dropped my iPhone and stared helplessly as it shattered on the ground. My cat pooped in the kitchen sink. I repeat: he pooped in the kitchen sink. I’m breaking out in a way I can only imagine will leave me looking like “Craterface” from Grease. I spent $50 on a tanning membership the day before my brother found skin cancer on his toe. I crashed my car on the way to the hospital—where my dad was having emergency brain surgery related to his terminal cancer diagnosis. And I’m happier than I’ve ever been. I’ve heard that life is a journey, to enjoy the ride. I’ve been reminded to count my blessings, to be thankful for what I have and to live each day as my last. But in reality—only when sh*t hits the fan are things truly forced into perspective. And I’m learning that it’s not such a bad thing. I won’t always be po’ (not poor…po’). And even if I am, at least I’ll be po’ while doing what I love. It’s summer in sunny San Diego and time to trade my black clothes for some color anyway. My iPhone still functions. In the battle between bleach and cat poop — bleach wins every time. Acne treatments have made leaps and bounds in recent years. Graham’s melanoma was successfully removed and he’s now a sunscreen poster boy/skin cancer awareness activist. My mom loaned me her much nicer car until I get the Prius back from the body shop. And my dad—-he’s a warrior. He’s a gardener, journalist, activist and road trippin’ son of a gun . He’s a lotus. There’s a Buddhist saying: No mud, no lotus. 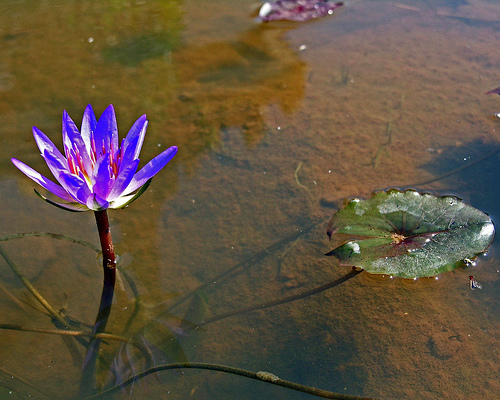 Lotus flowers grow in muddy, swampy water. Still, they bloom above their murky conditions unscathed and incredibly beautiful. We are all lotus flowers. Thank you Hannah for the great metaphorical story! You have a career in writing! Once again a great blog! The apple doesn’t fall to far from the tree. We all have days like that. You have so beautifully put it into perspective and reminded us of what we have to be grateful for. Thank you Hannah. Your are your father’s daughter. You are a very good writer. Keep it up! Love, Love, Love this Hannah! Thanks for the reality check. Sometimes we need to look past what’s in front of us, to be able to see what’s ahead! Hannah, Your Mom sold my daughter her house, your Dad worked with my husband Jack at Channel 10. I look forward to his bloggs and yours too. Stay strong, take care. See that the apple doesn’t fall far from the tree. You are a Nancarrow. I have bleached and ruined many clothes of mine and my daughters (but they will not forgive me for ruining their stuff)! So to solve the problem….I no longer had a bottle of bleach anywhere near the washing machine! It use to just jump out of the bottle and put little white spots on various black things….I could never figure it out!….I do not like tanning beds! It’s been known for years, the damage they can do. It’s enough that we go to the beach as young girls, cause lets face it “Tan looks good”!!! I have seen your dad many times through out the years…..my daughter is friends with your brother..and went to the same schools..etc. So I know what a very cool man he is, and what a champion he is, in the fight of his life! I pray for him and your family every day, and know that your life is tough right now! Take care, and stay the wonderful girl you are! Beautiful Hannah Jane! You put a much needed smile on my face today! Thinking always of your dad and his wonderful family! Your inner “Lotus” beauty blooms and glows as bright as your Dad’s……Love your family…..fight on …..life is lived in the trenches….. I absolutely loved your post. No Mud, No Lotus! You shared a life lesson. Namaste. Nicely put, and a good reminder. And isn’t it nice it to know we are not alone? We are never alone, as I have a BT, like your Dad, and a wife who stays close by my side. You or he can contact me at any time to discuss our experiences living with a BT diagnosis. Actually, at my age of 62 I could be the age of your Dad. No? We just keep on keepin’ on – living in the present moments we cherish! You are as beautiful as a Lotus flower inside and out. I am so happy that I am among your friends. Darlin’ keep it up. You’re writing is healing for you, I’m sure for your parents and all that other stuff, phone, poop, bleach (which you have already figured out at a very young age) is just crap (literally) that doesn’t last. Good for you! Such a delight to read your family posts. Thank you. Let’s all enjoy playing in the mud, just like when we were kids. Hannah, I haven’t laughed so hard in years. Thank you. You certainly have a way with words, it must be in the Nancarrow genes. Continue on this line of thinking and you certainly can’t go wrong. Blessings to the Nancarrow family. Hannah: we are at our happiest when we realize we are not alone! A few years ago I got my first tattoo on the inside of my left ankle…it was the Om sign. I put it there to remind me of a time some years before when I wondered if I was going to make it through a very rough year. Persistence and yoga got me through that year and therefore the Om. Om has reminded me that I am part of the universe and a part of everyone else existing in the the universe; I am not alone. Last year I got my second tattoo on the inside of my right leg above the ankle. This tattoo completes me because it is a blooming lotus flower full of gorgeous color – purple, pink, and white all in various stages of opening. At age 60 I am still opening, daily, to life’s joys, sorrows, and annoyances. The lotus only opens and blooms during the daylight; it rests and recovers at night knowing that it will bloom again in the morning. When my days seem quite “poopy”, I take a look at my tattoos (the Om and the lotus) knowing I am not alone; I am an integral part of the universe; and I am going to bloom again beautifully in the light of my life that comes from deep inside me! We all reach for the light that warms us and gives us understanding. You exude warmth in your words and in your understanding. Give yourself a big hug girlie. And thank you for sharing yourself with us all. Love this Bobbie C. May we all live as the lotus flowers…. maybe there has to be both the mud and the lotus flower, they cannot be without each other? Is it just our minds creating all the mud, and we truly are lotus flowers, but we don’t see it <3. Yoga is getting me through at this time too…. om shanti. Dear solumiere, thank you for your kind words. I hope your “muddy life” creates some beautiful lotuses! Wishing you many heartfelt blessings. Bobbie C.
Thanks for sharing. It is, truly, beautifully written, and most inspiring. Awesome view sweetie. Loved the read! I am now going to share your view with others. I hope not to bleach my black clothes but if I do I will remember not to get mad or frustrated. I will be thankful I had clothes to wash and an out of date phone to use and a family to love. Hugs to you! Wow. That is some fine writing. Good stuff, great message. And you are right…as the Bible says, without the hard times, we couldn’t grow, learn, gain empathy and understanding. Sorry for your bumps in the road, though. Thanks for such a fun and wise post. I suppose everything in life is how we look at it…. cup half full or half empty. What and how are we choosing to be today?